Two streetwise cops bust criminals in their red and white Ford Gran Torino, with the help of a police snitch called Huggy Bear. 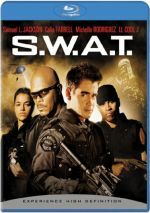 Some dramatic TV shows made into movies go with the “serious” route ala 2003’s SWAT. Others adapt the material for comedy, and 2004’s Starsky & Hutch goes down that path. Set in “Bay City” during the 1970s, we immediately meet drug lord Reese Feldman (Vince Vaughn), who shoots a thug named Terrence (David Pressman) when the latter botches a job. From there we encounter two cops. David Starsky (Ben Stiller) is an ultra-devoted straight arrow, whereas Ken Hutchinson (Owen Wilson) plays things loose and is willing to cross the line into illegal dealings if it benefits him. Their captain (Fred Williamson) partners the opposites, and to no one’s surprise, they don’t get along well at first. In the meantime, we see that Reese has developed a form of cocaine that police dogs can’t sniff. Starsky and Hutch happen upon the washed-ashore corpse of Terrence, and when they investigate, they find a business card for Reese. The rest of the film follows their investigation, as abetted by club owner, neighborhood boss and police informant Huggy Bear (Snoop Dogg). Setting the flick in the 1970s makes the comedic approach to the cop material much easier. That eminently mock-worthy decade never seems to get old, and Hutch scores some points with these gags. However, it rarely goes out of its way to play up those connections. Director Todd Phillips wanted to make a film that looked like it was made in the Seventies, but he doesn’t quite succeed, as it includes too many mockingly self-conscious references to the era’s silliness to feel like a product of the period. Nonetheless, he doesn’t go too far with that attitude, and that helps make the gags work better. Not that this means one should expect anything even remotely approaching a straight film, as Hutch always aims for the funny bone. It features a mix of action scenes to compete with the original TV series, but these always take on a comedic tone. Whether by subverting standard expectations or by pouring on the excess, the flick finds a light and humorous approach to everything. This means it walks a fine line between cleverness and stupidity, but it mostly stays on the right side of that issue. A lot of the credit for the film’s success comes from the pairing of Wilson and Stiller. They demonstrate terrific chemistry and play off each other exceedingly well. They make some questionable material work, and it’s hard to imagine this movie being as entertaining with other actors in the leads. A supporting cast with quite a few notable talents certainly helps. Despite a plot so thin that one might blow one’s nose into it, Starsky & Hutch provides an entertaining comedy. It spoofs its source in an affectionate and never comes across as unlikable or mean-spirited. A funny homage to the 1970s, it doesn’t stand a chance of turning into a classic, but it offers a lively diversion nonetheless. 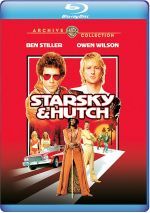 Starsky & Hutch appears in an aspect ratio of approximately 2.35:1 on this Blu-ray Disc. This turned into a surprisingly erratic affair. Sharpness became the main culprit, as definition could veer toward the soft side of the street. While much of the film showed nice delineation, more than a few iffy shots occurred. Given the movie’s vintage and budget, I wondered if these soft spots popped up intentionally, as a nod toward the story’s 1970s setting. However, I found no rhyme or reason to explain the softness as a photographic decision. Jagged edges and moiré effects caused no issues, and edge haloes remained absent. No examples of source defects popped up during the movie, as it always remained clean. To match the 1970s setting, Hutch used a lot of earth tones, so we mostly saw forms of brown and orange. The colors appeared fairly well replicated and firm. Black levels came across as deep and solid, while shadow detail looked appropriately dense but not too thick. Outside of the softness, this was an appealing presentation, but the inconsistent definition dropped my grade to “B-“ territory. While not overwhelmingly active, the movie’s DTS-HD MA 5.1 soundfield provided a nice setting for the material. The front spectrum featured most of the information and created a great sense of place. The elements moved cleanly across the speakers and meshed well to form a vivid and lively foundation. The surrounds mostly supported that, but they also kicked in a fair amount of independent information when necessary, and they added a good boost to the package. Across the board, audio quality worked well. Speech always remained natural and distinctive, with no signs of edginess or problems with intelligibility. Music was bright and vibrant, especially in the reproduction of period songs; those sounded quite dynamic and clear. Effects seemed vivid and accurate, with strong range and no distortion on display. The soundfield wasn’t quite ambitious enough to enter “A” territory, but I still felt satisfied with the audio of Hutch. How did the Blu-ray compare to the original DVD version? Audio showed a bit more range and impact, while visuals looked tighter and smoother. If you look at my DVD review, you’ll see higher praise for the picture quality, but that screening took place on a 36-inch tube TV and was based on 2004 standards for DVDs. Given 2019 expectations, the Blu-ray became an obvious upgrade, even with its inconsistencies. A smattering of extras round out the disc, and we begin with an audio commentary from director Todd Phillips, who offers a running, screen-specific chat. Unfortunately, it’s not terribly interesting. Phillips gets into subjects like visual design, sets and locations, improvisation, and the tone of the movie. However, much of the time he largely just tells us the names of actors and semi-narrates the story. We don’t learn a lot about the flick in this mediocre commentary. Next we find a featurette called Fashion Fa Shizzle With Huggy Bizzle. In this two-minute, 42-second piece, Snoop Dogg leads us through a tour of the outfits designed for his character. It’s superficial but cute. A twist on the traditional “making of” program appears via the Last Look special. This runs nine minutes, 20 seconds and includes comments from Phillips, producers Alan Riche and Stuart Cornfeld, and actors Ben Stiller, Owen Wilson, Vince Vaughn, Snoop Dogg, Jason Bateman, Carmen Electra, Amy Smart, Molly Sims, David Soul, Paul Michael Glaser and Juliette Lewis. A parody of the usual happy talk featurette, in this one everyone badmouths each other in a comedic manner. This makes it amusingly different but it doesn’t act as informative. Six Deleted Scenes run a total of six minutes, 31 seconds and provide some minor gags. A few funny bits appear, but nothing that expanded on the story, especially since many of them just reiterate the early tension between the partners. Probably the most interesting one is the final clip, as it shows an alternate concept for the ending. In addition to the film’s theatrical trailer, we get a Gag Reel. It fills five minutes and it presents the usual assortment of goofs and giggles. Given the overabundance of bad movies adapted from TV shows, I didn’t expect much from Starsky & Hutch. However, the film offered a refreshingly charming and amusing affair that consistently entertains. The Blu-ray brings very good audio along with erratic visuals and supplements. I can’t say this turns into a great Blu-ray, but the movie’s still funny after 15 years.